.Net Report Builder is a tool that allows.Net developers to add Do It Yourself Ad Hoc reporting feature to their software without much coding and some simple configuration. This means that your end users can quickly and easily build reports that are customized to their needs. While some software may allow users to generate reports, those reports are often confined to a handful of different templates. With .Net Report Builder, end users decide what fields are added to the report, how it’s formatted, and much more with a very friendly and intuitive Report Wizard. This is all done from inside your application, so there’s no need to export data or run another program. This software is for any Programmer or Software Company using ASP .Net Web Technology that wants to add ad-hoc reporting to their solution. It’s especially useful for SaaS providers in accounting, record keeping, CRM, e-Commerce and other database solutions where users will often want to create different reports that represent different types of data. For example, in accounting, a user may need to create reports for income, expenses, profit and loss within a specific time frame, income from specific sources, and other custom reports. Incorporating .Net Report Builder into an existing software takes very little time or coding. If the requirement is to build a standalone app for reporting only, that’s even simpler. First, the developer needs to set up the database schema in .Net Report Builder, which is easily done using the admin tool. Next, the developer has to setup the front end in an existing Visual Studio Project or a new one by simply adding .Net Report Builder’s nuget package contains the Controller, View and Script files will be added directly to the Visual Studio Solution. The next step is adding the Api keys to the web.config file. 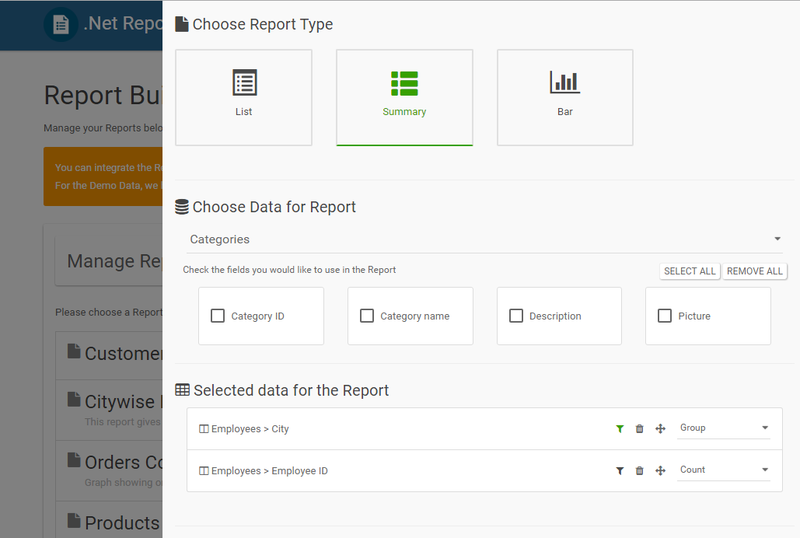 Once that’s done, you can open your application and see how Report Builder runs within it. You can easily make style, labels or other cosmetic changes if you need to. Note that setting up Report Builder does not require our company to have access to your client’s database or other information. We understand that most Companies will be especially concerned about the security of their information, but you can rest assure that we never need access to your client’s data or your SQL connection. Why Chose Report Builder over Similar Solutions? 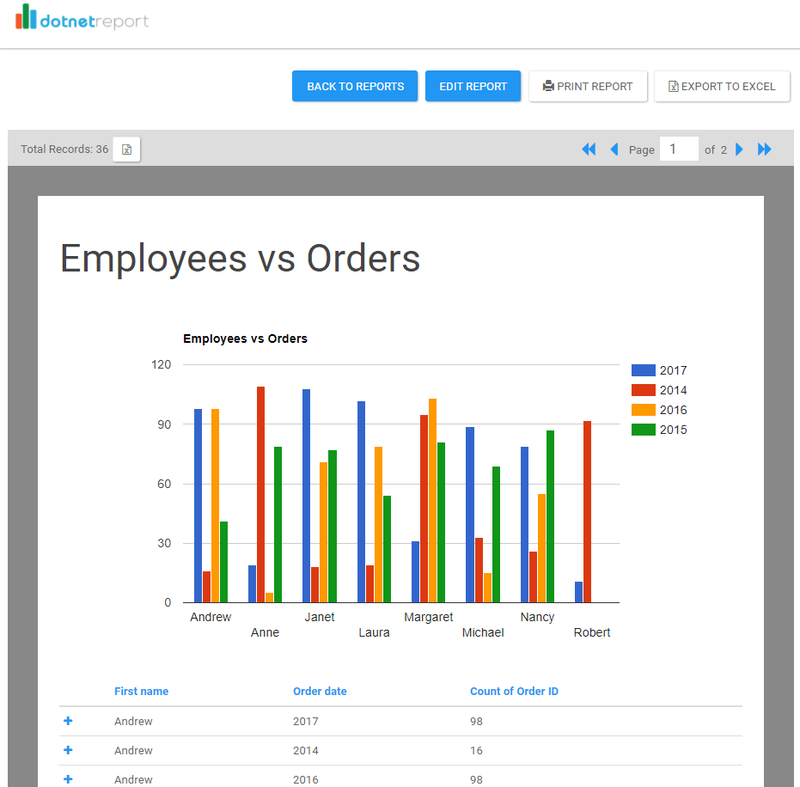 There are two major reasons Report Builder is a great reporting solution. The first, as outlined above, is that it’s very small and easy to install. It won’t add any considerable bulk to your program, nor will it take up hours of your programmers’ time in installing and configuring it. The second reason Report Builder outclasses similar programs is that it’s very customizable. You can incorporate Report Builder so deeply into your application that it’s virtually unidentifiable as a separate module. You can make it perfectly match everything you’ve done so that it doesn’t stand out at all. So it goes beyond white labelling. Report Builder offers many advantages over designing your own reports and templates. By allowing end users to create their own ad hoc reports, you don’t have to spend development time to create new report templates for them whenever they need one. With that task off your developer’s plate, you’ll be able to focus on other clients and building new features or applications. It’s very user-friendly and intuitive. Even simple end users won’t face much of a learning curve thanks to the easy to use interface. The Report Wizard makes selecting fields and applying filters very easy. Once created, a custom report can be saved and updated or ran at any time in the future.